In light of early spring here in the Midwest I made a spring pie yesterday! Well, two pies actually. One for eatin’ and one for freezin’ because why not double up if able, and make life a little easier on ourselves! I am all about resourcefulness and think my great-grandma Mabel would be proud. 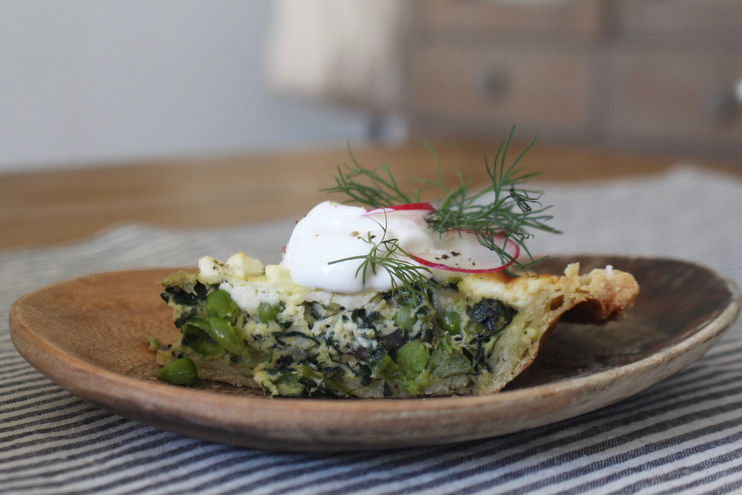 We are big quiche fans over here because the kids love eggs and I love feeding them simple, wholesome suppers. And have you met a person that doesn’t like quiche? I haven’t. One of the best things about quiches, and pies in general, is that they invite you to sneak in lots of healthy ingredients without having to eat them raw or whole, because after all, a pie’s a pie and almost all pies are delicious. 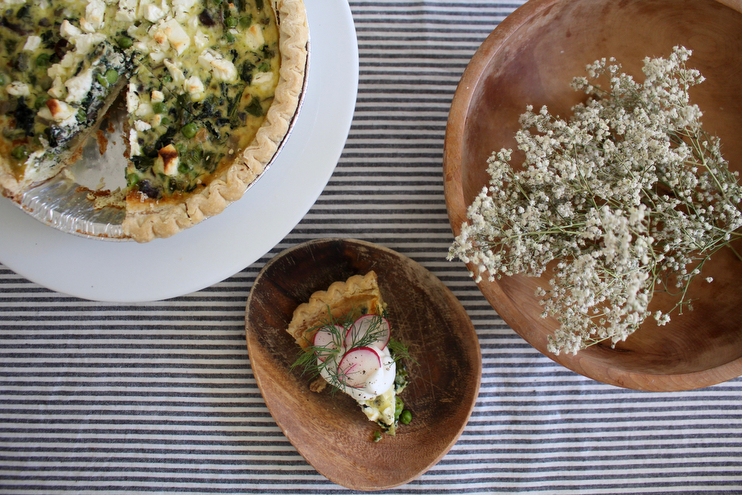 When it comes to savory ones, I love quiches because they are just so darn easy to make. Sometimes I make my pie crust, but usually not because I’d rather be reading or on a walk. Sometimes handmade is better, but if you can find a way to give yourself more time do that instead. I came across a new organic pre-made brand, well new to me, and they are really yummy. You can find them at most natural food stores, and like most pre-made crusts, they come in packs of two making it even easier to prep for future meals if you want to. Below is my trustee recipe, one I’ve been coming back to time and time again, but changing up the ingredients depending on the season and what’s looking good at the market. To prepare, prep your crust by following directions on the package, or make your own. I used a pre-made crust for this repcie and it really cut down on the total cook time. If you end up going the pre-made route, it’s likely that the directions will tell you to cook your crusts for a bit before adding the quiche mixture. You’ll want to poke holes in the dough and make sure it does not brown. 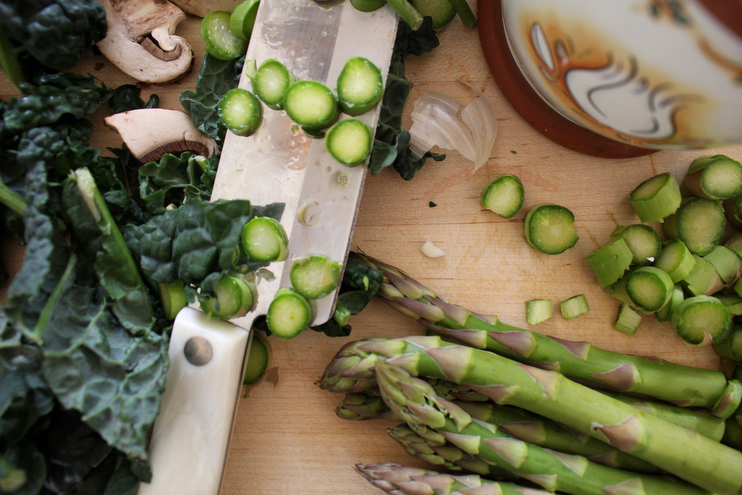 While the crusts are pre-baking, tend to your veggies by mincing and finely chopping and then setting them aside. Set your oven at 350 degrees. You’ll want to start out doing a few swirls of good olive oil in a sauté pan, along with a tablespoon of unsalted butter. Once the butter is almost melted, add the shallots and cook them until they are tender. It’s important to prep your veggies before starting this process so you can layer flavors as you go. Once the shallots are about done, add the chopped asparagus and mushrooms, along with the last of the unsalted butter. You can also salt and pepper at this stage for more flavor, which I always recommend. Once the mushrooms have absorbed the oil and butter and have browned a bit, add the minced garlic and stir well. Watch the pan carefully at this stage so the garlic does not burn, and once your kitchen smells of the goodness that is warm garlic, you can add the kale and dill. Stir once more and once the kale is wilted, turn off the heat and let it sit. While this mixture is cooling, take your crust out of the oven and prep your custard. You’ll want to whisk 8 good eggs – we love our local farm that delivers because both the flavor and health benefits are fantastic – with 1 cup of good-quality cream. Throw a pinch of salt and pepper into this mixture, and maybe a dash of nutmeg if you have it on hand. I don’t know what it does exactly, but it does something wonderful. Once your vegetable mixture has cooled, add half of it to each of the pre-cooked pie crusts. Once evened out, pour the custard over it, making sure half goes in each. The final stage before baking is adding the cheese. Crumble up the feta and sprinkle all over the top of the quiche filling. You could also use goat cheese or another tangy-flavored cheese. Sour works well with savory here. Bake your pies on a large roasting pan for 45 minutes or until the middle is no longer wobbly. I usually pull mine out at about 40 and do a little test, and if the top is browned nicely, I may just pull it out then. It’s up to you, really. Once baked, set aside to cool a bit and either eat right away, store in the fridge for tomorrow’s breakfast, or freeze. There are so many options when it comes to quiches. When you are ready to eat your pies, top each piece with a big dollop of sour cream, sliced radishes, and fresh-cracked pepper. Each pie respectably serves four and keeps for several days in the fridge if you’re making ahead. If you are freezing, it should keep for many months. I’ll be adding more seasonal pies and simple, kid-friendly meals to CHOP & STIR per your recent requests, so you can look forward to more help in the kitchen in the coming months! I also have a post nearly done about how to get picky eaters to eat well – something we work on in home year-round. What’s your favorite savory pie to make? We also enjoy chicken pot pie in the spring months, so I’ll share that recipe once flowers start to really bloom. I hope you enjoy this recipe, and if you make it, let me know how yours turns out!